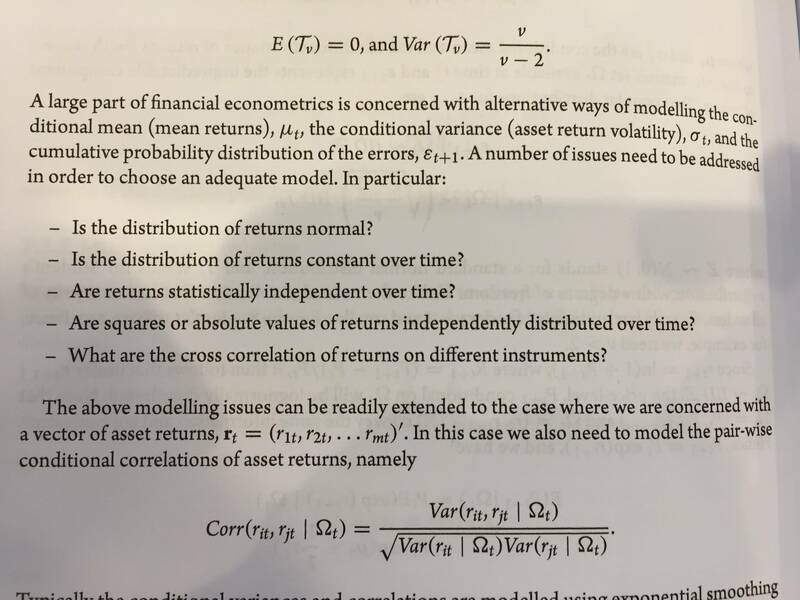 In a Time Series Book by Hashem Pesaran, he mentions that there are a number of issues that need to be addressed in order to choose an adequate model for predicting asset returns. I understand the other 4 considerations in the picture but I don't understand what it means for the squares or absolute values of returns to be independently distributed over time? Why is that different from the distribution being constant over time which includes the variance being constant over time? First it is not returns but residuals and squared residuals of your model that should be IID. Second, it is required that squared residuals are IID because you are not only interested on your mean forecast but also about the variance of your forecast. your forecasted value is still 0.5 but you know for sure that it has a certain variance (let's say 0.2) because it is derived of the variance of your squared residuals that is constant. In the second case you are able to build a confidence interval about your forecast but not in the first case. To sum up, residuals must be IID to be sure that the mean forecast is correct. Squared residuals must be IID to infer the variance of your forecast and to be able to build multi-step forecast and confidence bands. Not the answer you're looking for? Browse other questions tagged time-series returns distribution expected-return asset-returns or ask your own question. What is the Probability Distribution of Max-Drawdown?